The city plans to install a protected bike lane along a stretch of Seventh Avenue in Bay Ridge, giving the neighborhood its first on-street protected lane. The neighborhood advocacy group Bike South Brooklyn heralded the still-unannounced plan on Twitter on Monday. The city wants to install a new protected bike lane along Seventh Avenue between 65th and 84th streets, a stretch that cyclists tend to avoid because the roadway — which flanks the Gowanus Expressway — is basically a service road that is so wide that it encourages drivers to speed. 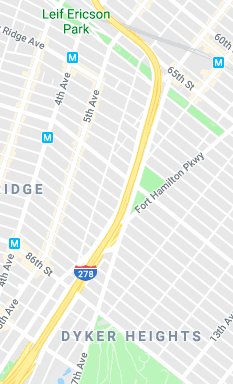 But if the city swapped out one of the speedway’s lanes for a physically protected bike path, it could make for a reliable north to south route that connects Dyker Heights to Park Slope, Sunset Park and other points in Bay Ridge, said Brian Hedden from Bike South Brooklyn. “If they are looking to change the design for fewer car travel lanes as part of a calming project to slow vehicles down and also take away some travel lanes for cars and turn over to cycling that’s the sort of thing, as long as it’s physically protected, could create a viable cycling corridor where it doesn’t exist now,” he said. Currently, Bay Ridge only has a protected bike lane along a small portion of the waterfront Promenade and on the Leif Ericson Park greenway, which as Streetsblog previously reported, might just be the worst bike path in the city, thanks to its missing signs, potholes, and garbage. But cyclists have no protected path to ride from one part of the neighborhood to the other on local streets, said Hedden. Seventh Avenue borders the Gowanus Expressway on each side — three lanes head south towards the Verrazzano-Narrows Bridge, while three others head north towards Sunset Park. The Department of Transportation wants to install the path on the southbound side as part of a larger school safety and traffic-calming plan, according to information from Community Board 10. It’s unclear if the bike lane would go in both directions, but Hedden says he’d advocate for a two-way protected bike path. The city wants to install a protected bike lane along Seventh Avenue between 65th and 84th streets. “If DOT thinks that Seventh Avenue is appropriate for a two-way bike path — they have certain exceptions, it might make the cut — that’s something would be worthwhile,” he said. Hedden’s group also recently proposed banning cars on just the right Staten Island-bound lane of the Verrazzano Bridge’s lower level to turning it into a cycling and pedestrian-only path during weekends over the summer. But the state-run MTA, which controls the span, quickly put the kibosh on that idea. Transportation officials will formally present the Seventh Avenue bike lane plan to Community Board 10’s transportation committee on April 1 at PS 170 in Bay Ridge. Other street safety improvements will be discussed this Wednesday during a Street Safety Town Hall with Department of Transportation Commissioner Polly Trottenberg, and local elected officials, including Council Member Justin Brannan, Assembly Member Mathylde Frontus, Rep. Max Rose, and Senator Andrew Gounardes. Street Safety Town Hall at PS 264 (371 89th Street between Third and Fourth avenues in Bay Ridge), 6:30-8:30 p.m. The line “quickly put the kibosh on that idea.” links to a story about Gowanus waste tanks. I don’t see anything in there about the Verrazzano. Is it going to be a REAL protected lane or a ‘faux’ protected lane with bollards every other mile? There is 60 feet between the fence and the edge of 278. Putting a vertical wall with a sound barrier on top of it at the edge of the roadway and filing behind it would create a huge park. There should be slanted parking on one side of the street, changing sides every fifty yards or so, and a bike lane. Fourth Avenue is far and away the most viable potential bike route linking Bay Ridge, Sunset Park, and Park Slope, but it's still scary to ride on, with no designated space for cycling. At 4.5 miles long, a protected bike lane would make the reconstructed Fourth Avenue one of the most important two-way streets for bicycle travel in the city, connecting dense residential neighborhoods to jobs and schools.